Over the past four years of my artistic practice, my definition of jewelry and accessories has grown along with my artistic expression. To me, accessories are the foundation of contemporary conventional fashion. Of all the accessories, jewelry is the most compact and the most portable. The portability of jewelry appeals to me because it reflects the way I live, traveling back and forth between Taiwan and the United States. Although many of my pieces particularly my rings, are inspired by a similar design motif, each piece represents a specific interpretation of these similar themes. 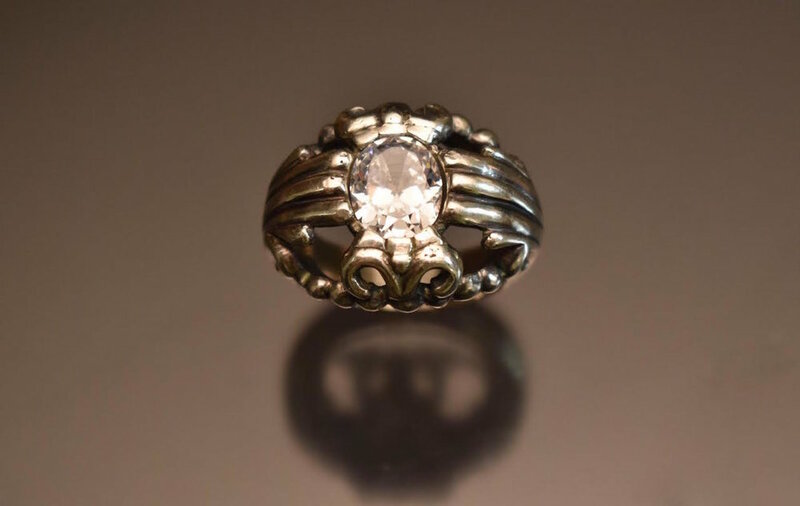 My choice of techniques, which is typically fabrication or lost wax casting, varies I develop as an artist. It is my goal to celebrate designs that conform to conventional standards while at the same time reanimating vintage accessory styles. The integration of contemporary and historical classical designs is my signature style. The idea behind this body of work is to achieve a sense of both nostalgic and contemporary presence. Although much of my work is similar to commercial jewelry, the boldness of my designs makes a statement empowering the wearer. All jewelry tells a story. When asked about an item of jewelry, people usually start off with an explanation of where it came from and why they wear it. There is something about this process speaks to me. The idea of being able to relive a special memory through a personal value, at the same time serves as a removable decoration to modify the body. I intend to instill each of the receivers with the realization that part of one’s personal narrative can be captured in a small item.